TETON COUNTY, WY—In an effort to give more people across the country an opportunity to visit the famous landmark, Yellowstone National Park announced Thursday that it would be putting Old Faithful on a six-month loan to Acadia National Park. 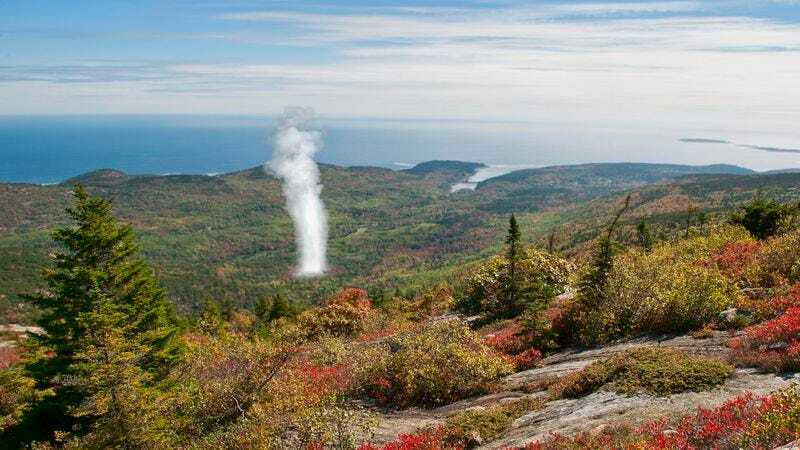 “As part of our collaborative partnership with other members of the National Park Service, we’ll be loaning out Old Faithful, one of our most popular tourist attractions, to Acadia National Park in Maine, where it will be on display from April to October as part of a special exhibition,” said Jody Lyle, Yellowstone’s chief of strategic communications, explaining that the geyser would be installed at the base of Acadia’s Beech Mountain Trail and that access to it would be included in the regular park admission fee. “East Coast residents will finally get the chance to witness the geyser’s spectacular eruptions and get a real taste of the Yellowstone experience. And to give our visitors something in return, we will be displaying Acadia’s Cadillac Mountain at Hayden Valley during the same time period.” Lyle went on to say that in order to ensure the massive geyser would not be damaged in transit, it would be shipped in multiple parts and carefully reassembled upon arrival.